This guide is designed to assist students enrolled in Environmental Science courses with locating Library resources for their research assignments. The guide is organized into steps that cover the basic research process for locating and citing relevant sources used in writing a paper or other projects. For general research assistance other than Environmental Science, view the links listed under Research Tools. Full-text articles are available, with a 18 month delay, and can be searched by year through the EBSCOhost database. Environment is an Academic Journal that presents articles on the problems of modern technology as they affect the environment. Full-text articles are available and can be searched by year through the EBSCOhost database.The International Journal of Energy and Environment (IJEE) is the official journal of the International Energy and Environment Foundation (IEEF). The journal is a multi-disciplinary, peer-reviewed open access journal, covering all areas of energy and environment related fields that apply to the science and engineering communities. ScienceDaily is best known for showcasing the top science news stories from the world’s leading universities and research organizations. Updated several times a day with breaking news and feature articles on the discoveries in all fields of the physical, biological, earth and applied sciences. Books, eBooks, and other Library materials can be searched using the Online Catalog. Books for Environmental Science are located in sections GE, and QC, in the Library's collection. There are two main categories of books: general and reference. General books (located in the "Stacks" on the lower floor) can be checked out and are often used for more in-depth research. Reference books (located on the upper floor) do not circulate but can be useful for acquiring an overview on a topic. 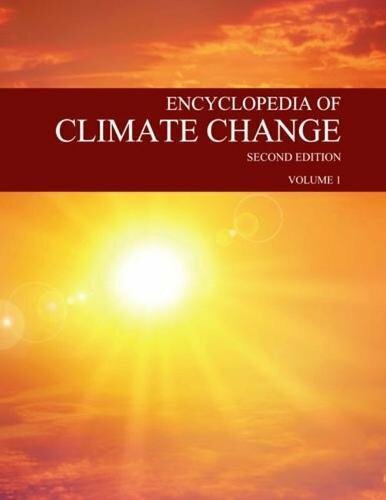 This new edition of The Encyclopedia of Climate Change provides comprehensive coverage of global warming and climate change, including scientific descriptions and explanations of all factors, from carbon dioxide to sunspots, that might contribute to climate change. A general and non-technical resource for students and teachers to understand the importance of energy; to appreciate the influence of energy on societies around the world; to learn the history of energy; and to initiate educational discussion brought forth by the specific social and topical articles presented in the work. The set contains 772 alphabetically arranged articles which cover a wide variety of topics, including endangered animal species, air pollution, national parks, environmental legislation, oil spills, alternative energy sources, and global climate change. Encyclopedia of Global Resources provides a wide variety of perspectives on both traditional and more recent views of Earth's resources. The articles in this set are extremely diverse, with articles covering soil, fisheries, forests, aluminum, the Industrial Revolution, the U.S. Department of the Interior, the hydrologic cycle, glass, and placer mineral deposits. This unique collection of nearly 200 Primary Documents examines the evolution of concern about environmental degradation, pollution, climate change, and resource conservation in America from the Colonial period the present. *Also available online as eBook's within Salem Press Online database. Sustainable development is essential to a future of reduced human suffering, higher quality of life, and ongoing sustenance for the planet's ecosystems. Designed to increase understanding, inform actions, enrich academic assignments, and enhance research, Macmillan's Achieving Sustainability: Visions, Principles, And Practices is a reference work intended to meet the needs of students and educators in high schools, community colleges, and four-year colleges, as well as the interested layperson. Through the use of primary source documents, readers can learn about key opinions and legislation in the important field of animal rights and welfare-a current and highly relevant topic. Thoroughly revised and updated to include the latest research in the field, A Dictionary of Environment and Conservation provides over 9,000 A to Z entries on scientific and social aspects of the environment - its key thinkers, treaties, movements, organizations, concepts, and theories.Covering subjects such as sustainable development, biodiversity, and environmental ethics, it is at the cutting edge of environmental and conservation studies.This is the ideal reference for students studying these subjects and anyone with an interest in environment and conservation. 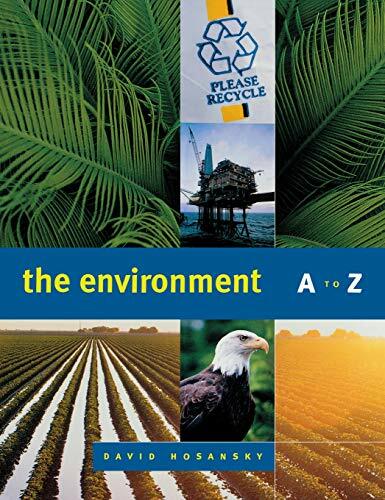 A valuable reference source with a comprehensive international scope, the "Encyclopedia" describes the important environmental terms pertinent to anyone interested in this vital field. Also included are over 200 detailed graphs, tables, and photographs. A list of key contacts helps readers expand their search of environmental issues. Discusses what has been done to protect endangered species in the United States and around the world, and examines the debate over what future actions are warranted. Presents the latest information on U.S. energy consumption and production, compared with years past. Controversial issues such as the U.S. dependence on foreign oil, the possibility of exhausting fossil fuel supplies, and the harm done to the environment by mining, drilling, and pollution are explored. Examines the steps that have been taken to protect Earth's natural environment and the controversies that surround them. In alphabetical order, summarizes the issues, terms, laws, organizations, and personalities shaping environmental policy, including information on federal bills, advocacy groups, and current environmental trends. How is water scarcity becoming a serious problem worldwide-including in the United States? This book provides a broad overview of water, sanitation, and hygiene problems faced by both developing and developed nations around the globe and suggests how these problems can be solved by imaginative and innovative thinking. Providing an exhaustive background on the history of genetically modified organism (GMO) crops and foods as well as the controversies surrounding these products, this book allows readers to develop their own particular viewpoint on the production and use of GMO substances. Provides timely and up-to-date facts, context, perspectives, and tools to make informed decisions about nuclear energy. * Surveys five decades of controversy and examines the effects of nuclear disasters * Explains why nuclear power is being proposed as an important solution to the problem of global climate change * Supplies opinions from experts and advocates regarding the future of the nuclear industry * Provides overview information on technical topics such as the nuclear power cycle, from uranium mine to waste storage; and the differences between reactor designs and their associated benefits and risks. Case Studies for Integrating Science and the Global Environment is designed to help students of the environment and natural resources make the connections between their training in science and math and today's complex environmental issues. The book provides an opportunity for students to apply important skills, knowledge, and analytical tools to understand, evaluate, and propose solutions to today's critical environmental issues. The heart of the book includes four major content areas: water resources; the atmosphere and air quality; ecosystem alteration; and global resources and human needs. Each of these sections features in-depth case studies covering a range of issues for each resource, offering rich opportunities to teach how various scientific disciplines help inform the issue at hand. Case studies provide readers with experience in interpreting real data sets and considering alternate explanations for trends shown by the data. This book helps prepare students for careers that require collaboration with stakeholders and co-workers from various disciplines. This book provides an outstanding single-volume resource on the topic of solar energy for young adults and general audiences. * Provides an accessible and useful technical introduction to the various ways in which solar energy can be used for heat production and the generation of electricity * Outlines some of the critical environmental, technical, economic, and political issues that have prevented solar energy from becoming a more significant part of the nation's energy equation * Includes primary source documents such as relevant laws, court cases, position statements, and other items that allow readers to directly examine the history of solar energy. Water quality and management are of great significance globally, as the demand for clean, potable water far exceeds the availability. Water science research brings together the natural and applied sciences, engineering, chemistry, law and policy, and economics, and the Treatise on Water Science seeks to unite these areas through contributions from a global team of author-experts. The 4-volume set examines topics in depth, with an emphasis on innovative research and technologies for those working in applied areas. This volume focuses on the social and moral issues surrounding water resources. While covering the fascinating history of wind power as a whole, this timely handbook focuses on current technological developments and the promise-and pitfalls-of wind energy as part of the world's energy future. A multi-disciplinary database providing full-text articles for more than 6,600 magazines and scholarly journals, including full-text for nearly 6,000 peer-reviewed titles. In addition, it includes peer-reviewed full text for STEM research, as well as for the social sciences and humanities. Provides access to a wide range of biology topics. The database includes over 285 titles, with more than 250 available in full-text. Biology-related topics include: Biological chemistry, Biophysics, Botany, Cytology and histology, Environmental studies, Microbiology, Microscopy, and Zoology. Tip: Click on the "Advanced Search" button to combine search terms. To refine your search, change "in Anywhere" to "Document text," Abstract," "Publication title," etc. Under "Limit to" select "Full text" and "Peer reviewed" (scholarly journals). A weekly online publication that covers current and controversial issues. Complete summaries, discussion covering all sides of the issue, and annotated bibliographies are provided for each topic. Users are able to view the current issue, search past issues, or browse by topic, pro/con, and date. Tip: Click the “Browse Reports” tab at the top of the homepage for a list of popular topics and pro/con issues. A collection of scholarly, government and general-interest titles that includes content on global warming, green building, pollution, sustainable agriculture, renewable energy, recycling, and more. The database provides indexing and abstracts for more than 384,000 records, 4,700 full-text. Provides a complete one-stop resource for information on social issues. Access controversial viewpoint articles, topic overviews, statistics, primary documents, links to Web sites, and full-text magazine and newspaper articles. Tip: Click the “Browse Issues” link in the site navigation bar for an A-Z list of popular topics. Provides information for California's Sustainable Winegrowing Program. The website also includes links to various sustainability resources and agencies for the entire United States. A non-profit organization that provides up-to-date information on environmental issues from around the world. Science News offers readers a concise, current and comprehensive overview of the latest scientific research in all fields and applications of science and technology. Founded in 1974 we are a non-profit association of public and private sector professionals with a common interest in serving the principles underlying the California Environmental Quality Act (CEQA) which include environmental assessment, analysis, public disclosure, and reporting. EnvironmentalScience.org's mission is to be the most reliable and expansive advocate for environmental science education and careers. NAEP is the multi-disciplinary association for professionals dedicated to the advancement of the environmental professions. Published annually by the U.S. Department of Labor, the OOH provides career information on duties, education and training, pay, and outlook for hundreds of occupations. Search under "Environmental Scientists and Specialists" to find a list of occupations. The U.S. Department of Agriculture (USDA) is made up of 29 agencies and offices with nearly 100,000 employees who serve the American people at more than 4,500 locations across the country and abroad. Many USDA agencies serve the growing organic sector. Whether you're already certified organic, considering transitioning all or part of your operation, or working with organic producers, we have resources for you. This portal connects you with programs, services, and educational materials that can help your organic farm or business. With a team of scientists and other dedicated professionals, the Department of Conservation administers a variety of programs vital to California's public safety, environment and economy. The services DOC provides are designed to balance today's needs with tomorrow's obligations by fostering the wise use and conservation of energy, land and mineral resources. The California Department of Food and Agriculture is organized into six divisions. The department operates at more than 100 locations throughout the state. These divisions provide valuable services to producers, merchants and the public. Many of the are conducted in partnership with local county offices of the agricultural commissioners and sealers. Groundwater resources play a vital role in maintaining California's economic and environmental sustainability. DWR has a long-standing history of collecting and analyzing groundwater data, investigating and reporting groundwater conditions and is responsible for implementing the Sustainable Groundwater Management Act. Presents information about environmental regulations in California and Cal/EPA programs and services. The Farmland Mapping and Monitoring Program (FMMP) produces maps and statistical data used for analyzing impacts on California’s agricultural resources. Agricultural land is rated according to soil quality and irrigation status; the best quality land is called Prime Farmland. CDFA’s Organic Program is responsible for enforcement of the federal Organic Foods Production Act of 1990, and the California Organic Food and Farming Act of 2016. These statutes protect consumers, producers, handlers, processors and retailers by establishment of standards under which fresh agricultural products/foods may be labeled and/or sold as “organic”. The Library maintains a collection of instructor reserve materials. These consist of textbooks, videos, and supplemental course materials that instructors have put in the Library for student use. To find what materials are available for Environmental Science, search Course Reserves in the Online Catalog. It is best to search by "Course Number" (ex. AGNR 170) in that an instructor other than yours may have placed an item on reserve. Materials can be requested at the Periodicals counter and generally must be used in the Library on a two-hour loan period. Photocopy machines are available for 10¢ a copy. The most common way to cite sources is to use a bibliography or "Works Cited" list at the end of your paper. The works cited list includes a citation for each of the sources you used to write your paper. The citations are formatted in a consistent style according to one of several standard citation formats. The two most common citation formats for college research papers are: (1) The APA Publication Manual (American Psychological Association) - predominately used in Social Sciences and (2) The MLA Handbook (Modern Language Association) - predominately used in Humanities and Liberal Arts. Copies of the MLA Handbook (LB 2369 G53 2016) and the APA Manual (BF76.7 .P83 2010) are available in the Library stacks and the reference collection. An abbreviated version of each style is also on the Library's website under "Research Tools" - MLA or APA. The abbreviated version contains examples for citing full-text articles from online databases and other selected sources. If you are unsure about when and why it is necessary to cite sources, see "Understanding Plagiarism" for a concise overview. Assistance with writing your paper is available at the VVC Writing Center. Always check with your instructor for the required citation format.